Our uPVC sliding patio doors are designed to complement our entire range of uPVC windows so you can get the perfect colour match. Harmonise the look of your home and choose from a wide range of colours. A great alternative to French or bi-folding doors, our double-glazed patio doors are ideal for rooms where space is at a premium. Thanks to their sliding opening system, they do not impact the immediate area. Our stylish and secure uPVC patio doors also open up spaces and help bring the outside in. Designed for a secure and effortless operation, our uPVC patio doors feature adjustable tandem rollers and anti-lifting blocks. Tandem rollers enable a smooth slide action whereas the anti-lifting blocks prevent the leaves from being taken off the tracks. The system has an excellent energy and weather performance with an A+ DSER rating and 450Pa respectively. 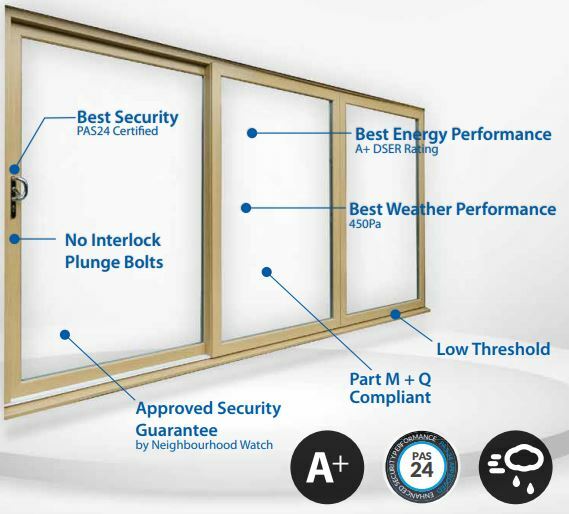 It also has the best security rating as PAS 24 certified and offers a low threshold which is compliant with part M.